A Seaman with a Man of War's Barge, Dominic Serres, 1777, National Maritime Museum. Dominic Serres largely focused on marine art in the more traditional mode: seascapes at enough of a distance to include the ship from waterline to masthead and well beyond both. Sometimes you can pick out sailors here and there, but they are incidental to his paintings, and not as integral to his art as the Cleveleys. In November 1777, Serres parted from his usual practice and etched and painted a series of images depicting the uniforms of the Royal Navy. These climbed the ranks of the navy from the seaman seen here through the midshipman, post captain, and other officer ranks to that of admiral. The sailor's short jacket is the typical blue and single breasted with a row of cloth covered or thread buttons. The short jacket has neither lapels nor collar, but does have scalloped mariner's cuffs with a three button closure which is open at least on the furthest button out. 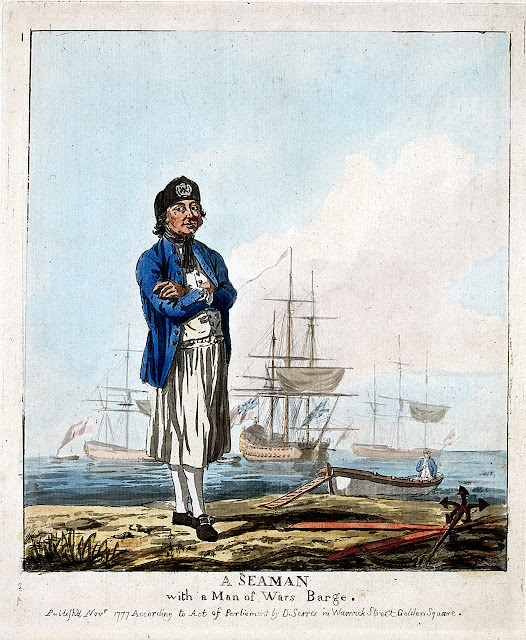 Our seaman's neckcloth is tied close and hanging loosely over his waistcoat. The hair of our subject is loose and short. His waistcoat is plain white and single breasted, without pockets and with cloth covered buttons. The cutaway of his waistcoat is very short, ending above the petticoat trousers. The petticoat trousers themselves are a plain white, stretching from the seaman's natural waist to the top of the calf. It is bound by a single button at the waist. His stockings are plain white, though of a slightly lighter hue than the petticoat trousers. His shoes are held by rectangular buckles of white metal. 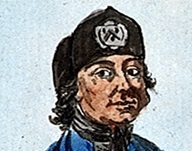 His hat is a barge cap, with a silver insignia on its face not unlike that described by Nagle and depicted in the portrait of Arthur Phillip in 1786. The barge is interesting for the mobile ramp affixed to its bow. 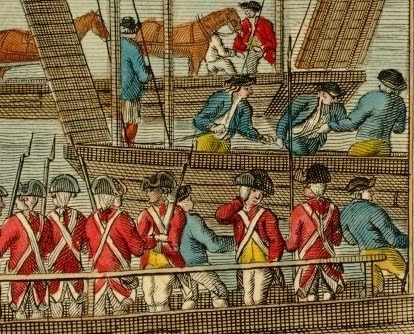 This may be the same sort of landing craft used to shuttle troops ashore during the New York campaign, a variation of which is depicted in the 1780 print A View of Gravesend in Kent, with Troops Passing the Thames to Tilbury Fort. to Tilbury Fort, F. West, 1780, Brown University. In the barge is a tiny figure of a second sailor, likewise wearing a blue short jacket and white waistcoat. His waistcoat appears slightly longer, but the figure is obscured by distance.